Bath County’s most iconic Gristmill is home to the award-wining Waterwheel Restaurant. Within the walls of a hundred + year old Mill, the Waterwheel is one of Bath County’s premier dining destinations since 1972. Come and explore our creative menu featuring the freshest local and sustainable ingredients often featuring vegetables and herbs from our onsite garden. This is our approach to contemporary farm-to-table dining at its finest. Our small group of highly trained individuals provide exemplary yet warm and personable service in a relaxed yet elegant atmosphere. Guests are invited to visit our wine cellar deep within the old mill foundation or enjoy a classic cocktail at one of the Commonwealth’s smallest bars – on one of the “best four seats in Virginia”. When it comes to unforgettable and memorable dining, the Waterwheel Restaurant boasts a long-standing reputation as one of Bath County’s most desired dining destinations. 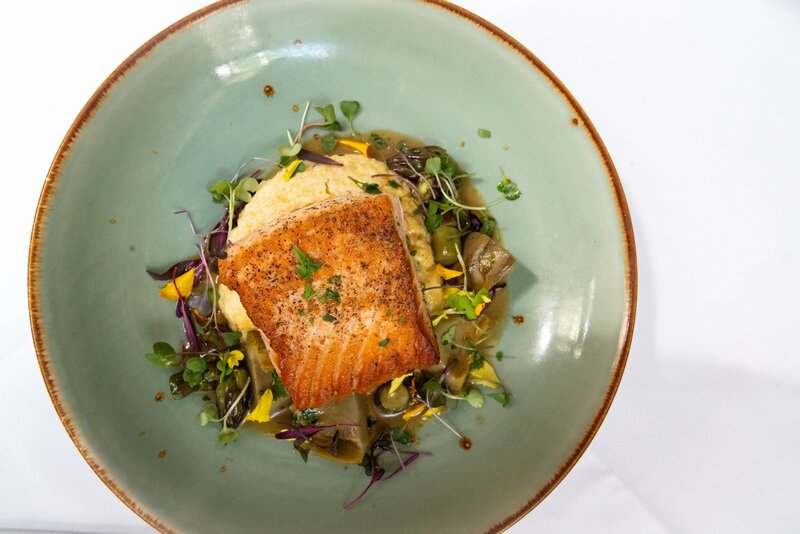 A favorite destination for visitors and locals alike, the Waterwheel Restaurant at The Inn at Gristmill Square should not be missed. Due to our small size reservations are always recommended. Call 540-839-2231 anytime to make a reservation, or send us an email request (email requests are not guaranteed until you receive a confirmation email from us) at stay@gristmillsquare.com. Scroll down for the OpenTable booking link. Click here to view the fine print for parties of 6 or more. For private events or offsite catering information information please visit our Catering page.